"...adding to the mesmerizing feel of the play is vocalist Christina Linhardt her other-worldly vocalizing introducing each act with the haunting lilt of family memories"
"On her new album 'Voodoo Princess' wild child Christina Linhardt is a fireball of creativity with a beautiful and pure voice that blazes an operatic trail of musical mysticism, taking you on a whimsical journey spiced with sprinklings of exotic and jazzy rhythms that bedazzle in songs 'Bedlam Boyzz' and 'Wolf at Bay'; disco flavored pop with 'Bengal Prince'; powerful theatrics with 'Elf King'; and heart warming songs such as 'Redwood Theatre' and 'Waterfall' that conjure visions of majestic beauty. There is no other sound like the album Voodoo Princess– it's simply delicious!." — Review by Lisa D. Smith, The Big Blend Magazine. 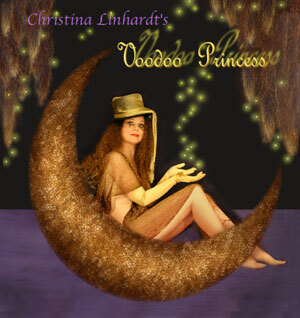 Inspired by her mystical journeys in the Caribbean, "Voodoo Princess" is the second solo cd of vocalist Christina Linhardt, the "Diva of the Secret Societies". Already having a propensity for the magickal arts as a child, Christina searched the globe from the Tropical Islands, to the Middle East, to Southern Africa for esoteric knowledge. Along the way she found love and passion which inspired her second album "Voodoo Princess". Disco grooves meet with Reggae flavorings, sprinkled with a touch of Bollywood here, and a smattering of Grand Opera there. Order copy of the cd "Voodoo Princess"